The purpose of this page is to show where to find the sync signals from PlayStation 1 motherboards so one does not have to use a sync chip. 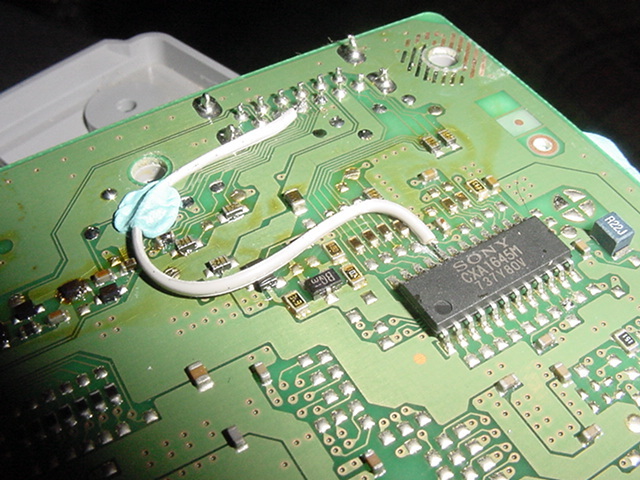 Unlike the very complicated PlayStation 2, the PlayStation 1 units are very easy to hack. Still, care must be taken whenever one opens up a game console unit. The following pictures are from a SCPH-7501 unit (Version unknown) motherboard and a SCPH-101 (Version unknown) motherboard. The Composite Sync circuit comes from Viletim!. Being that this is a Wiki page you are more than welcome to add any information that will improve the quality of information provided here. In the picture below you will see the main chip, the CXD8561, and the video chip, the A2106. You will also see a red rectangle. The sync signals are within this outline. 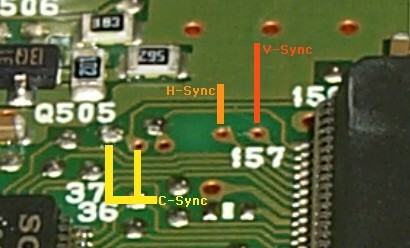 The picture below shows exactly where the Horizontal, Vertical, and Composite Sync signals can be found at the top of the motherboard (within the red rectangle). However, there is also another, and better, place to acquire the signals and that is underneath the motherboard as shown in the picture below. 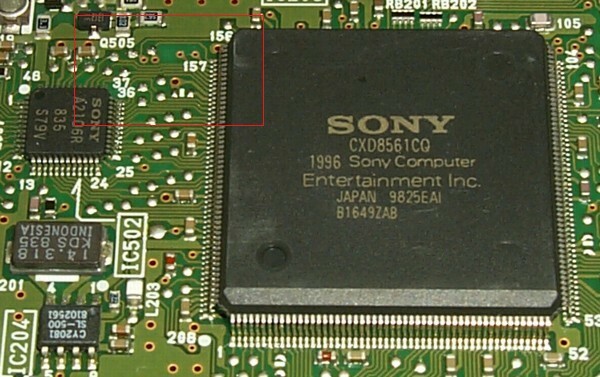 On the Playstation SCPH-5001 you can get the composite sync signal from the Sony CXA1645M encoder (pin 20), which is on the bottom side of the mainboard PCB. The smaller PSOne unit uses the exact same chips as in the older model and in the same orientation. So the sync can be easily found and used. In the picture below you will find where to tap the Horizontal and Vertical Syncs. You will note that there is no Composite Sync to be easily tapped into this time. You can make your own Composite Sync signal with two very simple components. 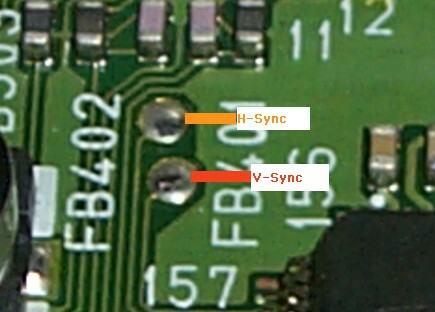 First, run the Horizontal Sync through a 1N4148 diode (very common - can be found at Radio Shack). Second, run the Vertical Sync through a 820 Ohm resistor. Once the two signals have been conditioned this way then you can simply splice them together.